Look, if you don’t want your ponies getting baths in the house, don’t make your bathrooms so user-friendly for ponies. Okay, so this video may have been staged (either that or this toddler is REALLY good at quick release knots, which is a distinct possibility) but it certainly does inspire us all to try that lifelong dream I’m sure we all have to bring our horses into the house. This lucky pony is getting a nice scrub-down with heated water in this family’s bathroom, which seems to be designed expressly for the purpose of washing down larger-than-children creatures. I mean, if you’re going to place a towel ring there like that, you’re basically asking to tie ponies to it and give them baths. 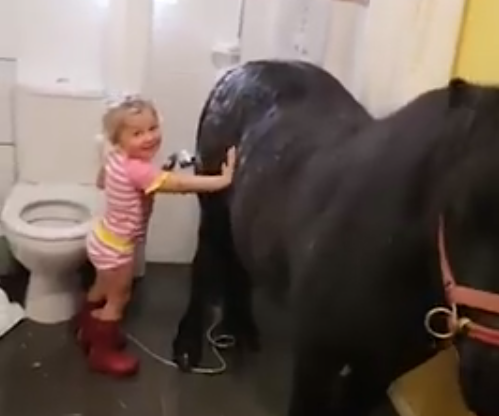 This toddler's decided to give her Shetland pony a shower! ?? Bonus points to this young equestrian for rocking some perfect rubber boots for the occasion.